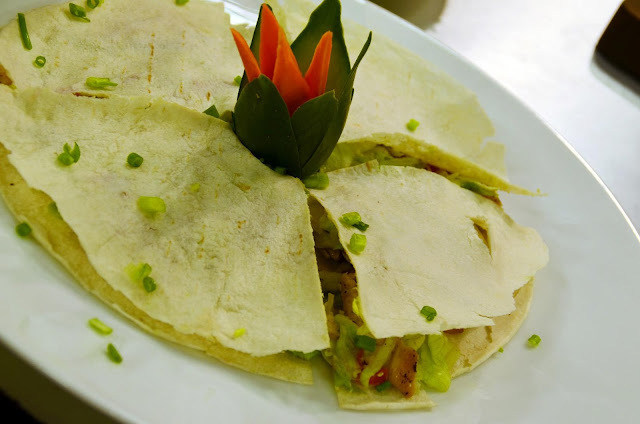 First to come out of the kitchen is Quesadilla Mexicana. You don't have to scream, "Andale! Andale!" to enjoy this classic Tijuana delicacy. Surely, not only it is a hunger smasher, it also provides some pretty cool bonding opportunities with your child's friends. 1. Heat large cast iron frying pan to medium high heat. 2.Add oil and spread around bottom of pan with spatula. Take one tortilla and place it in pan. Flip over the tortilla a few times. 3.When pockets of air begin to form in tortilla, take handful of grated cheese, sprinkle over top of tortilla. Add whatever additional ingredients you choose. Take care not to layer on the ingredients too thickly. 4.Reduce heat to low and cover pan. If quesadilla begins to smoke too much, remove from heat. After a minute, check to see if cheese is melted. If not, return cover and keep checking every minute until cheese is melted. 5.When cheese is sufficiently melted, use spatula to lift up one side of quesadilla and flip over other side. Tortilla should by now be browned slightly. If not, turn heat up to high and flip quesadilla over every 10 seconds or so until it gets browned. Remove from pan and cut into wedges. Note: To make lettuce to accompany quesadilla, thinly slice iceberg lettuce. Sprinkle some cider vinegar on it and some salt.